Janet Woolbar probably has the widest dance knowledge of anyone in the SIFD. We welcome Janet again to share some of these. To include several fun ones as they would be danced at an Armenian Party. We expect to share some of Dalila's repertoire of Israeli Dances too. For the first time at Great Alne, we can look forward to some dances from Orsolya Vegh. Presently based here in the Midlands, Orsi pronounced (Orshi), who was originally from Hungary, will particularly be showing us some Moldavian/Hungarian dances. Linda Moon can after many years, now again spend all of the long weekend with us. Linda will present some of the many kinds of couple dance in which she specializes & into which we can relax and enjoy the mood. James Eisner will, again do his excellent leading of part song for us during Sunday (and perhaps Monday morning too). 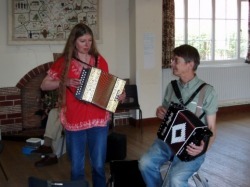 We hope to enjoy a late Cajun Couple session with Linda Moon showing the moves, and Flis playing on her accordion. Visitor from the USA - Sue Rosen - an excellent caller of Contra Dance from Massachusetts USA is visiting the UK. We hope to have the opportunity to enjoy Sue calling some Contras on Sunday Evening. Sue will be in Alcester on Friday evening - click on the link above for more details. Pete Grassby will again join us after his Fillongley weekend, to play and dance so that we may again enjoy French Couple dances. Monday. PLAN AHEAD NOW. Take a break on this working April Monday. Why? 1) There's varied dancing with space to enjoy the Hall. 2) A waitress served delicious choice of lunch with time to chat. 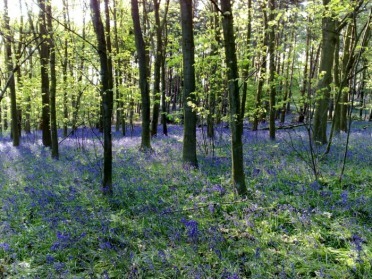 3) A concluding walk amongst the bluebells in Oversley Wood .